There will also be a question and answer session. 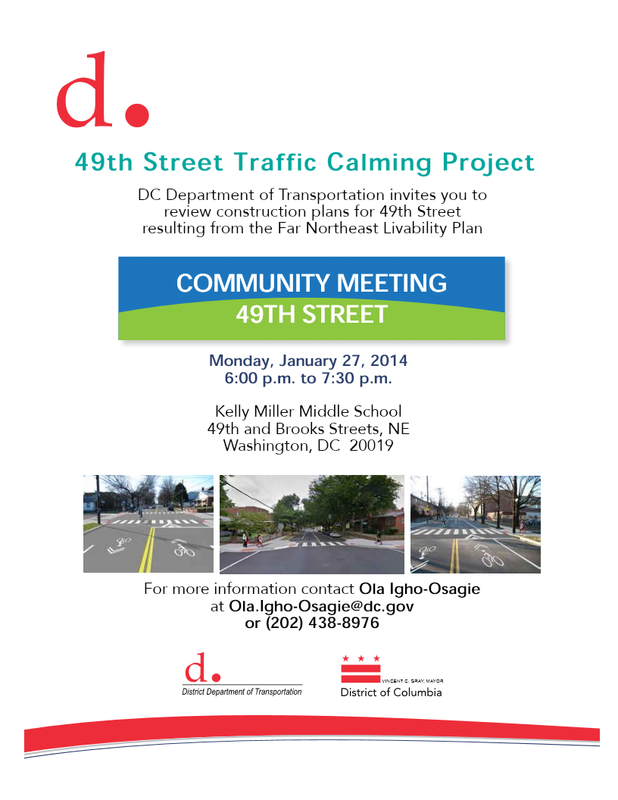 For more information about the meeting, please contact Brandon Cooper at 202-741-8528 or brandon.cooper@dc.gov. Mayor Vincent C. Gray and District Department of Transportation (DDOT) Director Terry Bellamy today launched the District’s sixth annual Potholepalooza campaign to expedite pothole repairs on roadways across the city. The Mayor and Bellamy helped fill potholes near the intersection of G Street and Benning Road SE to usher in DDOT’s month-long campaign for aggressively repairing potholes caused by winter weather. This year’s Potholepalooza will run through May 9. During Potholepalooza, residents and commuters are encouraged to phone, go online, tweet, email or use the DC311 smartphone app to submit requests for pothole repairs. Residents can track the Potholepalooza campaign’s progress via an online map. Reacting to the exceptionally cold winter of 2013-2014, DDOT crews have already filled well over 25,000 potholes – exceeding the total number of potholes filled in all previous Potholepalooza campaigns. DDOT will ramp up its already substantial pothole-filling efforts during Potholepalooza. As part of the campaign, DDOT is adding extra crews to fill potholes and aims to repair identified locations within 48 hours of the pothole being reported (the normal response time is within 72 hours). The first-ever Potholepalooza was held in 2009, and over the past five campaigns DDOT crews have filled 24,910 potholes. In 2013 DDOT received 849 service requests for pothole repairs during the month-long campaign and filled 3,899 potholes. DDOT has also partnered with local utilities to expedite repairs to utility cuts, which sometimes resemble potholes. This partnership, dubbed “Operation Smooth Streets,” aims to ameliorate more than 3,000 utility cuts during the Potholepalooza campaign. 5) Use the District’s new DC311 smartphone application. Those who report potholes should identify the precise location of the hazard, including the correct quadrant (Northwest, Northeast, Southeast, Southwest) of the District. They should provide as much detail as possible about the hazard, including the approximate size and depth of the pothole. DDOT crews will also be out and about proactively identifying potholes. How is a pothole repaired? Road crews fix a pothole by filling it with replacement pavement material. Cold patches are used for small potholes in low-traffic areas because they can be quickly applied. Hot asphalt is used in high-traffic areas or on large potholes, because it will hold much more effectively. If the road has become pitted with potholes, it may need to be resurfaced. Resurfacing a roadway involves stripping the upper layers of asphalt off, roughening the bottom layers, and applying a new upper roadway surface. The District Department of Transportation (DDOT) is holding its Semi-Annual Circulator Forum. At the forum, DDOT will solicit feedback from passengers on the strengths and weaknesses of the bus system to ensure the DC Circulator continues to meet the needs of current and future riders. 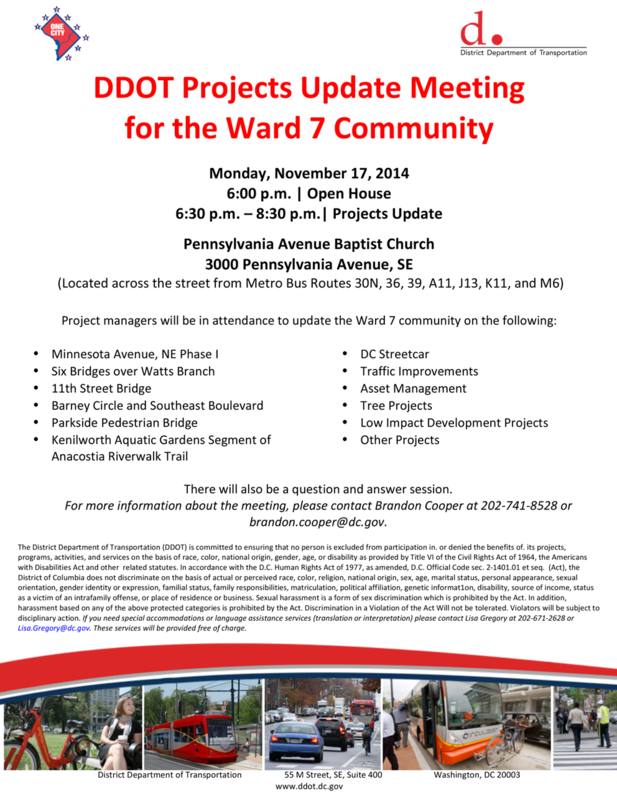 The Circulator’s route performance, future route extensions (including the planned National Mall route), a potential fare increase, and current operations are among the various items that will be presented and discussed at this forum. The 2014 DC Circulator Development Plan Update, currently underway, will also be brought up at the meeting. For those unable to attend this forum or who wish to submit comments at a later date please forward comments to Circe Torruellas at circe.torruellas@dc.gov or call 202-671-2847. You may also submit comments by clicking on the contact us link located on the DC Circulator website at dccirculator.com.